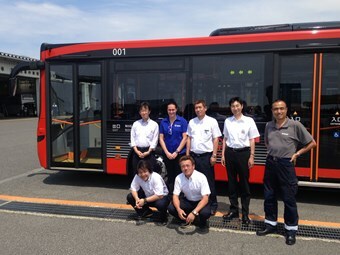 Australian and Japanese bus drivers have ‘remarkable similarities,’ according to and Australian driver trainer who was in Japan for the deployment of a fleet of Australian-built articulated buses. Scania Australia bus driver development trainer Alana Mountfield recently visited the country to assist a new Scania customer prepare for the deployment of a fleet of Australian-built articulated buses. Niigata Kotsu, the bus operator in Niigata, a city on the north-western side of Japan, is taking delivery of 15 Scania K 360 articulated buses fitted with Volgren bodies. These are the first Scania articulated on the road in Japan and they will run on a new Bus Rapid Transit route from the Niigata Railway Station to a major shopping mall, to try to reduce passenger car traffic through the centre of the city. Mountfield says Japanese drivers and Australian drivers have "remarkable similarities". "The biggest challenge for this group of drivers at Niigata Kotsu was their lack of experience in driving this combination of vehicle," she says. "The articulated buses and the concepts of driving a vehicle with trailer principles was completely new to the group. "In saying that, they picked it up quite quickly when provided with demonstrations, tips, feedback and encouragement to think about the driving task or manoeuver through anticipation." Mountfield was able to familiarise herself with the vehicles before she left which led to the most beneficial driver training package for the operator, Niigata Kotsu. "I have no doubt that as they continue to be exposed to the vehicles, that the familiarisation will enable them to operate the buses in the ideal way and their fuel efficient driving techniques will continue to improve." Mountfield provided ‘train-the-trainer’ instruction to seven head drivers as well as six technicians who will be looking after the vehicles when the BRT route service commences in September. A total of 50 drivers will be employed on the 7 km route. "My focus was on articulated bus familiarisation, functionality, fuel efficiency, reversing in a straight line, reverse parking and reversing into a bay at 90-degrees, plus driver attitudes and general operation of an articulated bus," she says. "We took the drivers on the route they will travel in the buses and explained to them how to drive the articulated bus around the bends, skills they picked up fairly quickly. "Although none of the drivers or technicians spoke English and the instruction was translated on the spot by a helpful member of the Scania Japan team, the result was a high level of awareness and understanding after the 3-day course," she says. This was Mountfields’s first international driver training opportunity and she says the program was very successful and the feedback extremely satisfying.